Three women, baring their music in an intimate space, exploring the intersection of borders, the unexpected resonances—where William Blake meets Native America, where Balkan boldness meets jazz finesse, where Haitian roots meet international vibes. 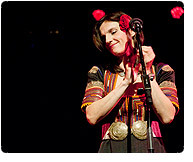 Live@365 (liveat365.org) will leap into a new season at Manhattan’s Elebash Hall, with an evening showcasing three intense, playful vocalists from diverse corners of the world: Martha Redbone (who takes her Native American roots into neo-soul and old literature); the vocally nimble Haitian singer Emeline Michel; and the Bulgarian roots- and jazz-inspired Vlada Tomova. Though diverse in their backgrounds and approaches, the three singers joined by a duo or trio, will be united in their approach of crossing musical boundaries. They will also find a common thread in their use of Elebash’s acoustic environment, which encourages close interaction between the performer on stage and the listener in the hall. 7 PM at Elebash Recital Hall, CUNY Graduate Center, at 365 5th Ave (at 34th Street). For tickets, see smartix.com or call 212-868-4444. The Graduate Center is the primary doctorate-granting institution of the City University of New York (CUNY). As a cultural and academic hub for music lovers, it offers a wide array of performances, lectures, master classes, and symposia. Home to a distinguished D.M.A program, as well as a world-class ethnomusicology department, it also houses the Barry S. Brook Center for Music Research and Documentation. The Graduate Center offers more than 30 doctoral programs across the arts and sciences, and a number of master's programs. It accommodates 33 interdisciplinary research centers and institutes, and provides an extensive array of public lectures, exhibitions, and theatrical events. Further information on the Graduate Center may be found at www.gc.cuny.edu.